After our league race on September 28, Shawn decided to give Project CARS 2 an additional spin by taking the concept Formula X car to the Long Beach track. The current world record is in the 1:03s… Shawn was able to get it down to the low 1:06s. Watch him have a go at it here! Forza Motorsport 7 Coming Soon! Garry Klutt, NASCAR Heat 2, and Canadian Tire MoSport at CP24! 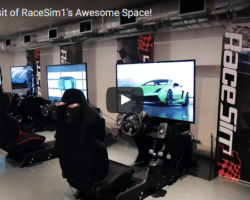 This morning, sim racing arcade RaceSim1, Canadian NASCAR driver Garry Klutt, NASCAR Heat 2 and the Canadian Tire Motorsport Park in Bowmanville ON came together at CP24-Breakfast Show. Show host Bill Coulter tries his best playing the soon-to-be released NASCAR Heat 2. See how he does in the video! Rajeev’s group was here bright and early this morning for some Forza Motorsport Racing action! Great group 🙂 These guys are real enthusiasts!